This one pan meal is well worth the wait—and it tastes even better the next day. It's easy to know what's in season and what everybody's cooking if you're plugged into the online food world. Since this is Memorial Day weekend, food blogs, foodie magazine websites, and e-mail in-boxes are overflowing with grilling tips, potluck recipes, picnic ideas, cool refreshing drinks, and ice cream. So what am I suggesting you do? Turn on the oven and slow roast a leg of lamb for four and a half hours of course. Just because I raise sheep doesn't mean I always follow the flock. Until we fell in love with grilled lamb legs steaks* a few years ago, I cooked all of our legs of lamb the same way: slathered with a thick layer of an onion and herb mixture similar to the one I put on my Herb Crusted Lamb Spareribs, cooked just until rare, and served as thick slices. This is an entirely different way to prepare leg of lamb, and I've fallen head over heels for it. Unlike traditional roasted leg of lamb recipes, this one cooks for several hours, but the actual prep work is minimal—and the entire meal uses just one big pan. With this method, the meat is cooked until extremely well done, but in a really good way. It comes apart with a fork, is sort of 'dry' like barbecue, and the texture is similar to my Slow Cooked Dutch Oven Lamb Shanks or Shoulder Roasts, only with some crunchy edges, which I think are the best part. The cooking time is also fairly flexible—which can come in quite handy—and it's pretty much impossible to overcook. This recipe is adapted from one I found in Falling Cloudberries, a delightful cookbook written by Tessa Kiros, the London-born daughter of a Finnish mother and a Greek-Cypriot father who grew up in South Africa, traveled and cooked around the world, and now lives in Tuscany with her Italian husband and two daughters. Full of color photos and friendly stories, this is the kind of book that's fun to sit down and lose yourself in for half an hour, even if you have no intention of cooking anything for the next month. Other recipes I hope to try soon include Pork in Red Wine with Dried Coriander (Afelia); Cypriot Baked Lamb and Potatoes with Cumin and Tomatoes (Tava); Cannellini Bean Purée with Olive Oil, Garlic and Sage; Roast Chicken with Grainy Mustard, Onions, and Herbs; Red Pepper Soup with Olives, Lemon Zest, and Yogurt; Olive Oil Picnic Bread with Oven Roasted Tomatoes; Lemon Ice Cream; Apple Cake with Toffee Topping; and Ricotta Tart with a Chocolate Crust. Tessa Kiros is also the author of Apples for Jam: A Colorful Cookbook, a playful book that offers anecdotal memories about family, friends, and the joys of childhood alongside its 200 easy, kid-friendly, comfort food recipes, at least two dozen of which I have marked with post-it notes. Both books celebrate the use of fresh, seasonal ingredients and would make wonderful gifts for food lovers. Since I think many of you would really enjoy these books, I'm giving away two hardcover copies of Falling Cloudberries. To enter, simply leave a comment in this post telling us something (anything!) about food and/or travel from somewhere around the world. The contest is over - thanks for all your great entries! This is truly a one pan meal. Don't let the long instructions scare you away—this really is a simple recipe. Lamb with lemon and oregano is a classic Greek combination I hadn't had before, and now I'm hooked on it. I used Tessa's recipe as a starting point and ran with it (which she encourages you to do throughout the book), adding lots of garlic, using fresh Greek oregano from the kitchen garden rather than dried, upping the lemony factor by chopping the juiced lemon halves into chunks and roasting them along with the potatoes, and making a ridiculously tasty side dish by braising Swiss chard and raisins in the lemony olive oil-filled roasting pan for about ten minutes while the cooked meat cooled. Swiss chard, which is both extremely cold and heat tolerant, is one of my favorite things to grow from seed. Find out how easy it is to grow your own Swiss chard here. The chunks of roasted lemons (don't you just love the sound of those two words together, 'roasted lemons?') are quite tart, but they almost melt in your mouth. I couldn't stop eating them. If not everyone you're feeding is a lemonhead, you could put the lemon chunks in one corner of the roasting pan rather than tossing them with the potatoes—or simply leave them out. The leg of lamb cut we get is called an American style roast; it has the bone attached, but no shank. This recipe would probably also work well with a lamb shoulder roast. I cooked this up while my hunky farmguy Joe was out of town recently and happily ate a bowl of leftovers every day for a week—sometimes even for breakfast, and usually with a dollop of sour cream stirred into it all. The flavors just kept getting better. When I ran out of potatoes, I started making lamb nachos with the shredded meat. Yum. I can't wait to make this during the summer, when I'll probably cook it in the evening after it's cooled down some, then serve it the next day for lunch alongside tzatziki made with garden cucumbers (I've been meaning to try this tzatziki recipe for ages) and lots of thick slices of juicy, vine-ripened heirloom tomatoes. As always, I urge you to seek out local and organic ingredients. Search for a source of local naturally raised, grass-fed lamb—as well as all kinds of other sustainably produced food—on Local Harvest. A digital kitchen scale is a worthwhile kitchen investment that makes life so much easier. I love my Oxo Good Grips 11-pound scale and often use it several times a day. It's also great for weighing postage. A heavy stainless steel roasting pan has so many uses (like making big batches of apple or pear butter) and is perfect for roasting vegetables because the tall sides allow you to easily stir everything around. Heat the oven to 425°. Trim the leg of lamb of any excess fat (ours never have any) and set it in a heavy stainless steel roasting pan. Halve the lemons, squeeze out the juice (I use a little hand held citrus reamer over an itty bitty strainer to catch the seeds), and, if desired, cut the juiced lemon halves into chunks. Combine the lemon juice and 3 Tablespoons of olive oil in a small dish and use a fork or whisk to combine. Pour the mixture over the lamb, rubbing it into the meat with your fingers. Season with salt and several grinds of fresh pepper, and then sprinkle with 2 Tablespoons of the oregano. Pour 1 cup of water into the pan around the lamb. Cook for 30 minutes, then take the roasting pan out of the oven and turn the leg over. Add more water to the pan if most of it has evaporated. Season with salt and pepper, sprinkle with 1 Tablespoon of the oregano, and cook for another 30 minutes. Meanwhile, peel the potatoes and cut them into bite-size pieces. Take the roasting pan out of the oven. Scatter the potatoes and lemon chunks (if desired) in the pan around the lamb, turning them over with a large spoon to coat them in the juice. Sprinkle them with salt and pepper and the last Tablespoon of oregano, then drizzle with 4 Tablespoons of olive oil. Add a little more water to the pan if most of it has evaporated. Cover the roasting pan tightly with foil, decrease the oven to 350°, and cook for 1½ hours. Take the roasting pan out of the oven and turn the lamb over. Scatter the garlic cloves among the potatoes, stir the potatoes, replace the foil loosely over the pan, and cook for 1 hour. The lamb can be eaten at this point, but if you prefer it browner, let it cook, uncovered, for another hour or so (without stirring the potatoes if you want them to brown a little), until the edges of the meat become crisp. Set the lamb on a large platter and cover lightly with foil. Move the potatoes to one side of the roasting pan, tilt the pan slightly so the juice runs to the empty half, and toss in the Swiss chard leaves (which will cook way down) and the raisins, stirring them into the juice and then spreading them out. Cook for about 10 minutes, or until the Swiss chard is wilted, stirring once or twice. Slice or pull the lamb from the bone with a fork and serve warm with the potatoes and Swiss chard and/or other suggested sides. Squeeze the roasted garlic cloves out of their skins and mix them into the potatoes or spread them on warm slices of crusty bread. *We do eat some of the animals that we raise here on the farm. You can read more about my meat eating philosophy in this post. And if you're in Missouri and are interested in buying one of our naturally raised grass-fed lambs, custom processed and packaged to your specifications and then frozen, please e-mail me for more information: farmgirlfare AT gmail DOT com. © FarmgirlFare.com, the slow cooked foodie farm blog where Farmgirl Susan shares recipes, stories, and photos from her crazy country life on 240 remote Missouri acres. My favorite foods are Mexican. My sister and brother in law are now experimenting with home made tamales. My memory tells me that the pork and raisin tamales made for the holidays are the best. I am working on this. I have been a watcher of your blog for a long time now and I dearly LOVE it! You make me smile every day and I thank you for that! I was a Semi Trucker for 23 years, then went into my artwork full time, then moved back to North Coast California to take care of my mom. She is gone now but I have decided to stay for a while. I am now a magazine editor and I work from home. This is the first year, since her death, that i have truley WANTED to garden again, and part of that is due to your blog and inspiration. Thank you for that. Now to hope to win that book! I used to drive truck from California into the Gaspe Peninsula of Quebec Canada. A tiny motel we stayed at had little restaurant. One of the deserts they used to have was some of the most decadent I have ever experienced. They called it Pudding au Chocolate. It was a deep rich fluffy cake with a hot molten dark chocolate inside and on top. (this was long before molten chocolate deserts were popular at all. I WISH I had a recipe for this desert. I have fallen in love with Chicken Green Thai Curry. I make it every chance I get as I simply cannot get enough of it. Also, I took a cooking class a few weeks ago where we learned to make Mexican Chiliquiles. They are heavenly!! This book sounds great! We love Greek food around here, and my kids even love falafel with plain yogurt on it (they're not up to the garlick-y tzatziki sauce I make...). My kids do like cucumbers, so they just get them plain on the side. I'd love to introduce the fam to lamb (which I love, but never cook). Fun contest! Due to a misunderstanding I ended up splitting a meal consisting of a pound of cheese and a bottle of wine per person in Nice. This was followed by going to a faux scandinavian bar named Thor, and further destroying myself upon finding out the cheapest drink there was a bottle of Duvel. Eating new food is one of the best parts of traveling! I was in northern Europe last fall and ate amazing falafel sandwiches in Amsterdam. Best I've ever had. The strangest food twist I encountered was french fries IN sandwiches in Belgium. Not with, not even on, but IN, as a filling. I concluded I like them better as a side dish! We spent two weeks in Spain a few years ago. The very last day, we finally tried the Iberico ham, which is from pigs raised in the Extremadura region of Spain and fed acorns from the oaks in the region. It's crazy expensive, and totally worth it. It tastes completely different from any other ham I've ever had. Yum. The strangest food I've ever eaten on my travels was Roasted Guinea Pig. I was on a medical mission trip to Ecuador, and the villagers, who are Quechua Indians, had a dinner for us to thank us for our efforts. Imagine our surprise when we were served roasted guinea pig. Our hosts thought it was funny that we consider guinea pigs as pets. This looks like a beautiful cookbook! One year I tried to get acquainted with my heritage by cooking Swedish for a year. We tried all the different holiday foods and traditions, ate yellow split pea soup every Thursday with lingonberry pancakes for dessert! My Grandma was born in the Netherlands and immigrated to the US to be "a cook for rich people." She was expected to cook French and rarely had time to cook anything for herself. I've often wondered about the food she grew up eating. The best thing I ever ate was a beef stew cooked with Guiness beer in a carvery (Europe's much classier version of a Golden Corral-type restaurant) in Dublin. I wouldn't even want to re-create it - just remembering it is enough! When we lived in Kansas City, we found many friends from India and Pakistan. The food they made for us was incredible, and ever since I am a sucker for anything curried. I love cooking Greek. I was raised with two parents who loved to cook and enjoyed trying new things. Though I still hearken back to our roots with that Texas pit slow roasted brisket. Thankfully those lessons in the kitchen and in life have passed on to me. My wife and I like to cook a fusion between Greek and Middle Eastern. I think the flavors meld nicely and sometimes are even the same. We even enjoyed some tasty Morels recently due to a successful hunt along our favorite walking path! Dolmades are on the list to try making next. Anyone have a recipe that is to die for? oh cool. i definitely miss my mom's cambodian cooking. since going off and setting out on my own, with a brief stint in the french side of the cooking world, i can't seem to find myself making the dishes she used to make, and when i try, it's not nearly anywhere near the flavor profile of my memory (and when i get to have her cooking the few times of the year i see her). there's not much i can specifically point to, but i miss the food of my own ethnicity. How exciting! They both look like wonderful books! I moved out to Seattle from Wisconsin about 2 years ago. In northern Wisconsin we dined on mostly traditional midwest food. When I moved out here my taste buds were awakened! My favorite dish I make at least once a week is a spicey vegetable curry. I'd NEVER had curry before moving here. I lived in China for a year and oh! the food that you cannot find in Chinese restaurants here anywhere. I'm headed back in a week though and very, very excited about all the foods to eat. I've got it mapped out down to the meal. As a child in the Atlanta suburbs, we didn't eat a lot of varieties of food as children. It'f funny because now me and my two siblings have branched out a lot but we still can't get our mother to try anything new. When I was in Italy I kept thinking my mother would have starved to death. Of course, as a poor student, I couldn't afford many nice meals in Italy. There was a huge price jump on menus- pizza would be about 8 euro and any meat dishes would be about 25. So more often than not I ate pizza. There was a really great restaurant out of the tourist area not far from where I stayed. I ate pizza there like 3 times a week for the two months I was there. I didn't mind it, though, because it was the best pizza I've ever tasted. My favorite meat is lamb. In the 50s, I grew up in a home where my step-father hated lamb and being "the man of the house" we NEVER were allowed to have it for a meal. My Auntie was stubborn and didn't like my step-father because of the way he treated me! Every time we had a family meal at her home, she served roast leg of lamb (just for me)! I loved my Auntie and Nanna. Auntie Rie basted lamb with ketchup, chopped onion, and lemon juice and it made an amazing glaze. She stuffed garlic and flat leaf parsley near the bone, and cooked the lamb to a medium doneness. My new home is in the North Georgia Mountains where I convinced my butcher to buy lamb. He grunted and groaned for a year, then finally agreed he'd "try to sell it." Two years later and he is happy I talked him into it. Also, the butcher was THROWING OUT THE RIBS...I told him to save them for me. Yummm...your recipe for herb crusted ribs...on the grill... are fantastic. Once, many years ago, I lived in Puerto Rico for a year. One afternoon, we went up into the mountains with one of the bartenders at the local club to see his humble little home. His wife went out into the backyard, grabbed a chicken and proceeded to take it from running around to the best chicken I have ever eaten. She flavored it with achiote seed sauteed in oil and it was, and still is, totally unforgettable. Hi Susan - we always say that our sheep are lucky because we don't really care that much for lamb (cooked that is) - but this recipe looks awfully tasty. Speaking of lambs, I can't believe that Cary is three years old. OMG, where does the time go? My food thought for the day is Rhubarb Pie - and I would go have some, but someone (who shall remain nameless) ate the last piece without sharing! It was a good one too - with just a cup of strawberries to give that little hint of sweetness. There's lots more out there in the garden - I may have to make another one tomorrow :-) Enjoy your spring days. T.
there are 2 types of "food" that i love, japanese & mexican, and they are on the opposite spectrum from eachother in way of cooking. while living in NY i became friends with some individuals from japan and they taught me some homestyle japanese cooking that makes my mouth water just thinking about it. and while living in NM i learned about real mexican food. the lamb recipe looks DElicious! I have been following your blog for a little while now and I am in love with your donkeys and sheep...too cute! Anyway...I grow tons of tomatoes all summer long and enjoy just a simple salsa. Vidalia onions, tomatoes, lemon or lime juice, cilantro, and tons of salt and pepper. Great to eat alone or use in a salad or on top of chicken. YUMMMMM!! I lived the nomadic Army lifestyle as a child, and associate comfort food with my mother's Wisconsin cooking, little german markets with crunchy brotchen and cheese, and Mexican food, all of which I've included and tweaked in my repertoire over the years. Since moving to Boston, I've experimented with chinese, greek, and indian... but my signature foods tend to be the ones I've resurrected from childhood. I even used your tomatillo relish recipe as an inspiration for my own enchilada sauce! The title of the cookbook caught my eye. Almost 20 years ago (yikes...really?) my husband and I traveled to Finland. My husband had the opportunity to do research at the University of Helsinki for 3 weeks. I has the opportunity to shop and wander. We discovered cloudberries in jam, and liquor (not as good). It was a wonderful trip and great opportunity. I found your blog yesterday while searching the web for an arugula pesto recipe. I made the pesto last night (my first time...so good!) with a few modifications. I love that my local farmer's market is stretching my culinary know how! I love trying new ethnic foods. It is my version of traveling these days. I have Apples for Jam and I am so glad Falling Cloudberries is available again. I have a wonderful food memory from my trip to Ireland. Its not a place you associate with cuisine, but we found fresh seafood, cheese and pastry everywhere we went. It goes without saying the tea each day was lovely. The most unusual things I've eaten while traveling were a sauce (for a fried river fish) that was made with the heads of fire ants. It was spicy in a way that was completely different from any other spicy hotness I've ever had. That was on the edge of the Amazon in Venezuela. I also sampled some kumys, fermented mare's milk, in one of the former Soviet republics. Haggis in Scotland I enjoyed too, but I won't rank that up there with the really unusual stuff. Favorite food memories from travel all hail from Italy though, of course. Olive oil, stravecchio Reggiano Parmesan, incomparable pastas, and radicchio trevisano. Thanks for the chance to win a nice cookbook! Love your blog! Lamb Shanks is my all time favourite dish to cook for company. The house always smells so good when guests arrive, and even folk who say they don't like lamb, lick the platter clean! Newfoundland is famous for its cloudberries! I have the chance to travel to Chile each year and have fallen in love with the empanadas there, stuffed with seafood or with beef, olives and raisins. You can get them baked or fried! When I traveled to Ghana a few years ago I was excited to eat many new foods. Instead, I ate yams every single day. Yams, yams, and more yams. I was even there for the yam festival. These are not the orange sweet potato 'yams' that you find in the States - they are white, dry, starchy, and can be pounded, dried, and boiled into a variety of different forms (fufu, gari-gari, fries, etc...). One time I was enjoying a lovely bowl of catfish stew with fufu, and looked down to see the whole catfish head sitting on top of my fufu staring straight at me. Then I bit into it's boiled egg sack. I have not eaten yams since I left Ghana, and am okay with that. I have taken control of my life and coming back from a 1.5 year illness. I am now an "ultrarunner" and nutrition has become my new game! I want to cook beautiful food, but not with all the heaviness. I have a family of 5 - so I still need to keep it fun! The kids love all your animal pictures! Ooh, I'm happy to have a chance to win that good-looking book. I am enamored of mediteranian cooking since living in Turkey 26 years ago. I LOVED the fresh use of herbs and vegies there--so different from the prepared foods I grew up on in the 1960s and 70s!! So I delight in cooking that way now; hey BTW, I love your blog, it's vicarious living for me! I'm a dedicated local foods fan and it's no different when I'm traveling. I like to sample the specialty dish of the region, wines, liquers, desserts - these are usually easy to find because people are proud of their regional foods and will encourage you to seek them out. I've been to Germany in white asparagus season, Sevilla when oranges are falling from every tree into the streets, drank a zillion ports in Porto & Lisboa and had hand-crafted beers in probably every place I've ever been. Spit-roasted chicken in Portugal, bi bim bap in Korea, sake and noodle soup in Kyoto or fresh baguette & cheese in Paris, food and travel go together like... chocolate & peanut butter. Two of the best things in life! My Mom was Greek, and I do miss her Greek home cooking so much! It was always simple fare, but very tasty. Lots of spices and special flavors blending together like a symphony for my tastebuds. I love cooking and baking. This book would be a wonderful addition to my collection. More fun recipes to explore! Since moving to Texas, the thing I've missed most was the great ethnic cooking I enjoyed after spending my early adulthood in Portland, Oregon. I could eat spicy Indian food for lunch and dine on Moroccan lamb stewed in sweet sauces. In this beef-and-pig area, it's difficult to find any meats that aren't, well, traditional. Even the ethnic food stores don't seem to stock things like goat and lamb regularly. I was really happy to find a local CSA farm that raises goats, and I bought an entire (butchered) young goat this year to experiment with. The only foreign tastes I get tehse days are from my own oven. Even if I'm not a winner, I will probably buy the cookbook just based on your recommendations! Ha -- I've had my eyes on this cookbook forever because I've LIVED in Finland, ALMOST LIVE in South Africa (twice) and well - have visited Greece and England? Anyway, I'm glad for the confirmation that it's not to miss. As for food experiences, my favorite food in Finland was the squeaky cheese (and the bread and chocolate and lingonberries and the fried fish at school and and and ...) and my favorite in South Africa was all the many kinds of fruit juices and my favorite in England was a magnificent tomato salad (still memorable since way back whenever) and my favorite in England is always curry takeaway! When I was 11 I travelled to Australia to visit relatives and was horrified when I was offered lamb to eat,which I refused.Now,at 46,I am always on the lookout for new lamb recipes as I raise sheep myself.I never imagined it at the time,but I did always dream of living on a farm. My farm is small,but it's mine and it feeds me. I am a fan of most food that doesn't eat me first and will try anything once. However, when husband and I were in Europe for two weeks, by the time we were at our final desitination (Amsterdam), I was so sick of the "Cheese Toasty" sandwiches (which is nothing like a grilled cheese - just melted cheese between two pieces of toasted bread but one of the cheapest things on menus all over Europe), and since we were running out of cash and couldn't afford any more upscale restaurants, we actually went to an American Hard Rock cafe for a staple we hadn't had in over 15 days - a juicy Cheeseburger. Wasn't as good as ones in America, but we were desperate and ready for something familiar. It is me again and I noticed a comment from Carol from Paris TN. That is my home town and would love to visit with her if she has a blog....or she can visit mine. Thanks Susan for all your friends. Ohhh I love Tessa's books and don't have that one. Let's see - a fun kitchen memory. My husband and I toured Bali and were thoroughly amazed how the Balinese women make impressive huge dinners in their outdoor kitchens - just a big wooden table and a firepit. And I'm complaining that I need more oven space! The oddest stuff that I have ate was seal oil and seal stew. The stew was very good. I had 2 bowls of that. The seal oil? let just say that thank God there was tang to wash it down with. Lets not talk about the seal oil burps hours later! I lived in Japan for a couple of years and really miss the food. I lived in a region that was famous for soba! My favorite meal there was shared with my friend Mika, her daughter, mother, and my boyfriend. There was a very old restaurant at the top of a mountain where they cooked all-vegetarian Zen Buddhist meals. We had about 15 small dishes, including all kinds of mountain vegetables that I'd never seen before. It was incredible and definitely a meal I'll never forget. I loved Chinese hotpots where we'd cook meat and shrimp and veggies in broth right at the table in the winter. I enjoy your blog! The postings here bring back sooo many memories. Like the time in a small cafe in Baha where the fresh lobster lunch was incredible - and we both ordered a second lunch prepared in another way, but just as good as the first. The most memorable dinner was right here in the US as we passed through somewhere in Louisianna. The cajun restaurant in this small community was hopping with folks feasting on crayfish. We decided we needed to try it for the first time. First you decaptiate them by pulling the head off. The naked body had a yellow streak of yucky looking stuff down its back. Our instructer scouped her finger down the yellow stuff and sucked it off her finger. She almost lost us right there. We bravely struggled through the pile of tastey morsels, taking about ten times as long as the folks around us. Much better than frog legs was our verdict. Never had them since, but never forgot the experiance. I am dying to try Edna Lewis's Fried Chicken Recipe. It is so simple sounding, I don't have Lard on hand and want to go pick up a cast iron chicken fryer to do it right. Some day soon I will... it is supposed to be the best! While in London, I was introduced to pub food. The Lamb Stew at a pub in the Paddington area was excellent. Some of the ethnic foods I like to make are falafels, potstickrs, tabouli, teriyaki chicken and enchiladas. Oooh! Great giveaway! Lets see -- right now, I'm thinking about taking a trip to Vietnam with my mom, mostly for the sake of learning how to cook (and eating LOTS) of Vietnamese food! We love to try new recipes from other cultures, but love the seasonal, local (and organic) recipes too! (I bought the Shelbourne Farms cookbook from your suggestion) My favorite travel food memory is eating mache with easy vinagrette (hazelnut oil, dijon mustard, red wine vinegar and salt and peper) in Grenoble during my semester abroad in 1988. Struggling to grow mache in hot and dry Colorado, but have not given up yet! We are not able to actually travel right now (though we dearly would love to do so!) because my husband is in the middle of a mid-life career change, and going to graduate school. So, instead, my girls and I "visit" other countries by reading library books, watching videos, going to local festivals, and mostly, COOKING! This year we are studying the Medieval time period, and I am really captivated by reading about the history and cultures of the eastern Mediterranean areas: places like Syria, Turkey, Persia, etc., even up into Georgia. These areas have been a bit of a "black box" for me as my education didn't seem to go beyond a paragraph mention in a textbook, if that. Our current favorite book is "The Cooking of the Eastern Mediterranean" by Paula Wolfert. We _love_ eating healthy, yummy food and imagining we are sharing a meal in someone's home, listening to their music and stories.... Just another five years, and maybe we'll really get to board that plane and see it with our own eyes!! In the meantime, THANK YOU to all you authors who can help transport the rest of us to places (and times) around the world! Had many tapas meals in spain. Sometimes i wasn't all was sure what was in it. The most unusual was we order a hamburger with the works at one of the many stops in spain and it included a fried egg! Yum. Love all types of spices, curries etc. Always try to go to ethopian, indian, greek, etc.. restaurants when we go out. But i do love a traditional southern meal as well. Had one of the best in eufaula alabama where they had the best buttermilk pies ever! Oh my that lamb sounds wonderful I have to have our butcher make some steaks for us when we butcher in teh fall. I am a local foodie and have had a wonderful chance to live in Puerto Rico where cuban food rules. I miss the wonderful street food and the tropical fruit. I am happy to be here on our little farm and eating what we raise.. keep up the great work your blog is awesome! My father immigrated from Germany and his older sister, my Aunt Clara, was the best cook and baker I have ever known. She could prepare a pork roast like none other, and her baked goods were unbelievable. The Christmas goodies were a sight to behold and tastes beyond description. Try as I may, I cannot duplicate them. All of her recipes were "in her head" and observing and writing down was a futile process. Please include me in your book drawing. Recipes have come to my family from Russia, Portugal, Yugoslavia, and Texas. The ones from Texas were delivered by my husband, who is Texan from a long line of Cave Texans. My most unusual food experience was when we went to visit my brother in Japan. He was working in a research lab on a National Science Foundation grant. His coworkers wanted to throw us a "Welcome to Japan!" dinner party at the lab. Oh, the awesome, delicious home cooked food! Chicken yakitori, fried tofu, fried veggies, soup, lots of sake, etc. They would tell us what each dish was, and why what they cooked was the best (just like a bunch of little old church dinner ladies). And then, in its crowning glory, in the middle of the table, in the place of honor, was.... a bucket of Kentucky Fried Chicken. Yep, they had just recently started opening KFC restaurants in Osaka and this was considered to be American cuisine at its finest. I think they also wanted to make sure that we had something we could eat, just in case we didn't like their food, but we were so full, we couldn't eat more than a small piece each, to be polite. Looks like a wonderful book. I've always been interested in learning how to cook Greek food, and this book might finally make that possible. Thanks for the great blog, I check in every now and again for pictures of farm life. I visited a friend in Moscow in 2002, and had the chance to eat many amazing home-cooked meals with his family and friends. What I'll never forget is the borscht! Every Russian cook seems to have a different recipe, and each one is delicious. P.S. I have Apples for Jam, and it's one of my all-time favorites! That lamb looks ridiculously delicious and I love the Lamb Nachos idea! I'm definitely trying that. In the tiny town of Abenberg, Germany (which is barely a town but really more like a cluster of houses with garden gnomes clustered around what used to be a castle fortress) there is a family-run restaurant called the Golden Star. Eating on the back patio one June day, I ordered the "house dessert", and the waiter walked to the blooming Elderberry bush, snipped off a couple of the disc-shaped blooms, and returned a few moments later serving us icecream topped with batter-fried Elderberry flowers. 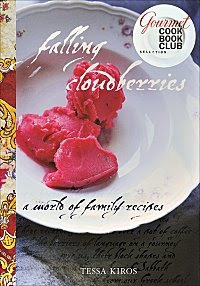 I would love the Cloudberry books because I'm part Finnish and I'm an adventurous cook. The first time I tasted Salmorejo in Cordoba, Spain -- I was travelling by myself and stopped at a little restaurant run by a chef named Paco and a waiter named Paco (I call it "Salmorejo de los dos Paco"). Paco brought me this soup and I tasted it and could not believe the level of flavors going on. I fell in love immediately. Being the only customer in the restaurant at the time, I had struck up a conversation with los dos Paco, and emboldened up enough to ask for the recipe. When they gave it to me readily, I read the ingredients and thought surely it was a trick - how could something so delicious consist of so FEW ingredients: tomatoes, bread, olive oil, garlic & salt. You know how stingy American chefs can be with their recipes? Maybe this was their way of being nice to the American lady... But when I returned to Ohio, I hosted a soup party with a friend, and made Salmorejo for my feature - it was just as amazing back home. And yes, it really was just five simple ingredients. Ooh! Ooh! I want to win a cookbook! #1-Visiting a friend in Beijing we went out for dinner at a Spanish restaurant. Turned out to be Sealed With A Kiss. #2-Chinese food in Zurich - waitress greeted us in German, switched to English when she realized we weren't Swiss, then French for the next table. I enjoy such a wide variety of food, I can't really name a particular favorite. I do vividly remember the first time I was in another country and saw their pizza toppings... which included tuna fish! I'd never heard such a thing. Thankfully, my horizons have been greatly expanded since then. I'd love to use this cookbook to expand them even more! I love all kinds of ethnic food and over the winter started cooking North African stews. YUM. I also love most food types - the hubby, not so much! He'd be happy with roast turkey and mac n cheese all the time. I really enjoy reading your blog. I discovered it from the A Year In Bread blog. Your Farmhouse White Bread is a favorite in my house. Your doses of cute always provide a much need pickup and all of your recipes are fantastic. I would love to win the book. One of my favorite activities is to sit down and read a cookbook. My favorite food travel experience was a trip to Spain. I ate Spanish tortilla at just about every restaurant. Despite all being made from egg, potato, and sometimes onion, every one was subtly different, and all were delicious. The most entertaining experience was when one waiter asked if I wanted my tortilla Spanish or French style. Being excited about a possible variation, I asked what the difference between the two were and was told that the French tortilla was plain like French cooking. I love all sorts of food, my favorite story to tell is when I went to Germany to visit a friend, her husband was stationed there, and I learned how to make enchilada's! Ooh, a cookbook giveaway! 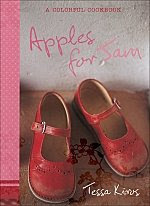 I've had Apples to Jam on my wishlist for a while but this one looks equally as good. I love to try different foods and have had some that I didn't care for (I can think of a particular tapas in Spain that was a mistake) but most I like. I at some intersting things while living in southern France too and will never forget the pizza with the egg on it. For some reason, I immediately thought of a trip I took to France when I was a teenager. It was the first time I'd traveled abroad (or anywhere, really) all by myself and I was desperately homesick. I was also a teenager and looking cool was of utmost importance. In any case, at one point, my host family took me to a friend's house where they were preparing roasted rabbit. I was a vegetarian at the time (see prior note about looking cool) and the idea of rabbit kinda sketched me out, but I also didn't want to be rude or look like I couldn't handle eating something a little weird (again, see prior note about looking cool). So...I ate it. And I loved it. I remember the rabbit being so succulent and moist and rich. I'd never had anything like it. And I'll never forget it. P.S. Back home, resolutely denied having eaten meat on my trip to all my vegetarian friends. Of course. Thanks for posting - looks like a great book! I am embarrassed to say that at 32, I still have not even attempted to make lamb! I live down the street from my (Greek) parents, and as much as I have watched them put together the most delicious authentic feasts, I have been afraid to attempt it myself! Perhaps a cookbook would be better to go by than my mother's guestimated ingredients, directions and amounts. I just don't have the gift of cooking like so many others do. I think the oddest thing I have had was in Italy. A combination of Grappa and Gelato blended together. Depending on the Grappa it can be intoxicating or rank awful. I honestly don't know what's the strangest food I've ever eaten. Thank God my parents taught me to always try a bite of whatever you're served, and ask questions later. It served me well during my high school exchange year in Japan, where knowing what I was putting in my mouth would have occasionally been quite detrimental to actually getting my mouth to open. I usually did ask questions later, but didn't speak enough Japanese for a long time to actually understand the answer. And I was probably better off that way, anyway. I *love* your blog. Thanks! Ohhhh, that lamb looks good enough to reach through the computer and gobble down! I lived in northern Italy (Alba) for four months last year, and fell in love with their local pasta, tajarin. There's so much egg yolk in the dough that it comes out yellow. I also probably drank too much Barbera and Nebbiolo. I spent 4 months during college studying in Denmark and grew to love their bread. The best translation is rye bread but it's nothing like rye bread here in the states. Unfortunately I'm told it's VERY difficult to make well. And that was by a friend who has been to culinary school and lived in Denmark for years. Given that I wouldn't even know where to try to find the correct flour I've given up on the idea of trying to make it myself. I just wanted to let you know that I tried your recipe for the slow roasted lamb and it is fantastic. Although instead of using swiss chard I made it into a warm salad with baby asparagus and baby spinach leaves. For the dressing I warmed on the stove: white balsamic, finely sliced onion, tiny vinegared capers, sultanas, some grain mustard and evoo. So I tossed the meat, garlic, potatoes, asparagus and baby spinach in the warm dressing and it was really, really good. I'll be making it again soon! I love your blog, it's in my reading list and it keeps me inspired. And reading everyone else's food experiences was wonderful too - thanks so much. I cooked this recipe with parsnips, carrots and sweet potato instead of the swiss chard, and rubbed garlic in to the lamb as well. Absolutely delicious, I would cook it again and again. Coming from Australia, where roasts are a weekly meal for most families, we were still blown away by it. Love your blog! Could you please tell me how many people this lamb dish is for? I'm planning on making it for Easter dinner (non-traditional, yes!!! ), and need to know whether to increase the proportions. I'll be cooking for 4-5 people. Great minds think alike! I've been meaning to write up a little something about how this recipe would be really nice for Easter. I think that with a 4½ to 5 pound leg of lamb there should be plenty of meat for 4 to 5 people (the bone doesn't weigh all that much), but you might want to buy a slightly bigger one if you can find it. I would also increase the amount of potatoes to at least 3 pounds, and if you're going to cook the Swiss chard, too, cook up LOTS - it really shrinks down. I hope everyone at your table enjoys this recipe. I just love it. Followed your recipe for Greek roast lamb. The meat was very dry, though reasonably tender. Maybe the 350 deg was too high. The potato was good, the chard not a great success.